If I had to trade every spaghetti western for just one film, I’d chose Django in a heartbeat. 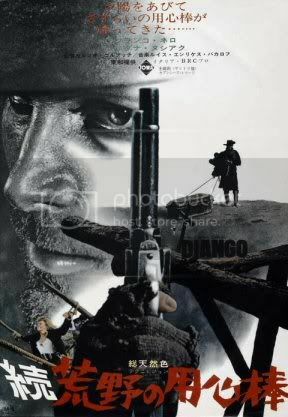 When I discovered Django several years ago, I had only ever been exposed to Sergio Leone’s work in the genre. I would watch The Good, the Bad and the Ugly over and over again (not easy to do since it’s 2 hours and 40 minutes long) and to be honest, I was totally content with that. Then I rented Django and the floodgates opened. Not only did I discover my favorite spaghetti western of all time but it also triggered my interest in tracking down more titles. Sergio Corbucci’s 1966 masterpiece is so unbelievably awesome that it threatens to jump off the screen and shoot you in the face (or cut off your ear). It’s bleak, wildly violent and ultra cool in almost every way. The image of Franco Nero dragging a coffin behind him through the mud is impossible to forget. Corbucci perfected what I call the “spaghetti depresstern”. If you’ve ever seen his 1969 film, The Great Silence, then you know what I’m talking about. 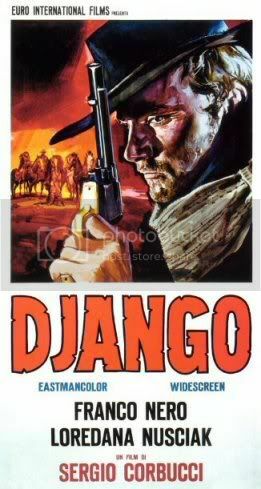 I urge everyone to check out the original Django (and ignore most of the fake sequels) without hesitation. Even if you hate westerns, you will love this movie.